Floods! | Monty's Potting Shed - Gardening tips and more for Gardening lovers. The rain has poured and the floods have risen. 2012 was prophesied to be the year the world ended and this latest deluge certainly has something biblical about it. Over 800 homes have been flooded as torrential rain and storms hit parts of England and Wales. The worst affected being Devon and Cornwall, with Worcester also taking quite a heavy soaking. The terrible weather has caused devastation for many home owners and with rain set to continue for the next couple of days, worst could still be to come. One woman from Cambridgeshire has even lost her life in a tragic accident seeing her crushed my falling tree. It looks as though the North of England is next in line to take a battering from these rainy conditions as the wet weather front moves menacingly that way. Roads have turned to rivers. 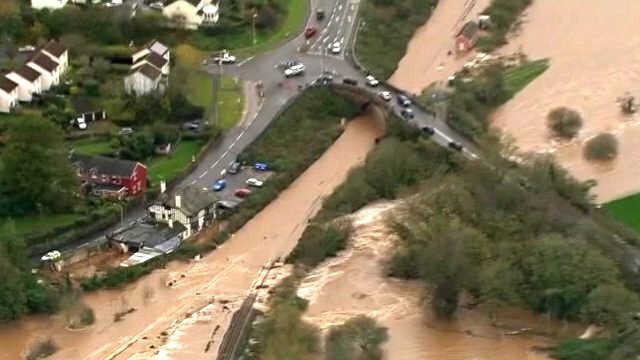 Our thoughts are with everybody who has been affected by the floods.